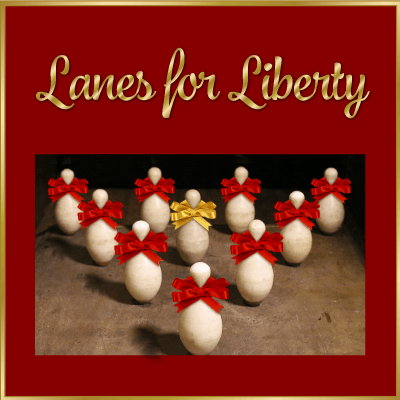 In a fun way to recap a productive year and launch the 2018 election season, the Libertarian Party of Rhode Island invites members and the public to Lanes for Liberty at Breaktime Bowl and Bar, 999 Main Street Suite 1330 in Pawtucket, RI, on Thursday, December 7, 2017 from 6 p.m. to 9:30 p.m.
Breaktime Bowl and Bar is the vintage duckpin bowling alley in Hope Artiste Village, the repurposed Hope Webbing Mill complex. Built in the 1920s by Hope Webbing owners for employees, the original lanes are one of the last surviving industrial recreation duckpin bowling alleys in the United States. In those historic surroundings, the LPRI celebrates the upcoming seasons – holiday and campaign – in a fundraising event that includes bowling, light refreshments, an abundance of fun and good cheer – and perhaps a campaign announcement or two! Tickets are $20 each if paid by November 30; on and after December 1, tickets are $30. Click here to purchase tickets.